The April selection for The Kitchen Reader book club was My Life from Scratch: A Sweet Journey of Starting Over, One Cake at a Time by Gesine Bullock-Prado chosen by Shelley of My Little Chickadees. I actually got this book for Christmas and read it a few months ago. First I have to profess my disappointment in the title of the book. 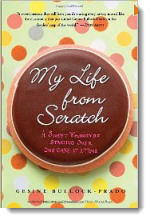 My Life From Scratch is the paperback edition of what was originally called the much more risque-but-amusing Confections of a Closet Master Baker: One Woman’s Sweet Journey from Unhappy Hollywood Executive to Contented Country Baker (link is to the Kindle version). The new hardcover version seems to be called Starting Over, One Cake at a Time. Ok publishers, you’re terrified of offending anyone, we get it. When I first heard of the book it was because of a video promotion the author had done. It was a bit sassy, but straight-forward. My curiosity was piqued. Gesine Golden Egg Demo from Raymond Prado on Vimeo. Gesine (guh-zeen-uh) is the sister of actress Sandra Bullock, and the book tells her story of quitting her job at her famous sister’s production company to move to Vermont to start a bakery. My mom read the book right after me, and her comment was, “No one would care if her sister wasn’t famous.” To some extent, I agree. Her story wouldn’t be as dramatic if she had quit any pedestrian job and opened a bakery. There are plenty of people who do that. But her sister is famous and she wrote a book about it. So there. Having seen the video, I felt the earnest-if-not-eloquent writing is close to her real voice. It may be brusque at times, but she never claims to be otherwise. It was an easy read, which was good, because I read most of it at the hospital sitting with my dad. The bad part about that is the main reason Bullock-Prado quit her high-pressure job was because she re-evaluated her priorities after her mother died of cancer. While her experience definitely resonated with me (especially as a fellow stress-baker), it was a little too close-to-home at the time. Perhaps with a bit of distance I could actually enjoy the book more, though at the time I appreciated her honesty and the look inside her decision to quit her high-stress job to do something she really wanted to do. Could she have been this successful without her sister? Maybe not, but she is. There are also amazing-sounding dessert recipes sprinkled throughout, but I didn’t actually try any of them. The book itself is a bit like a light, sugary dessert: sweet, but not substantial. Her brick-and-mortar bakery has closed, but you can visit her online shop or follow ClosetMastrBakr on Twitter. Have you read My Life from Scratch? What did you think? Check out the Kitchen Reader blogroll for more opinions. You (and your mother) have made a good point, Stacy. There are plenty of people who could have told the same story, minus the actress sister. I did find that Bullock-Prado’s German childhood was an endearing part of the story,and I enjoyed reading about her grandmother’s 3pm coffee and cake time. This book (and Medium Raw last month) makes me realise I could never be in the full time food industry. Life would be just too hectic! I think where I’m torn is that yes, other people do have similar stories minus the famous sister. But she does have a famous sister and that fact has affected her life. It’s not like she can really leave it out. Agreed, the 3am wake up times are never going to be for me. And I just realized I never sent this book back to you. Oops. I think I’ve decided that this book might have been better if she had waited until she was older to write it. Maybe then she would be a little less bitter and a little more insightful! Hmm. That’s an interesting take. I guess that was my problem with reading it — the situation was too close. Thanks for this book tip. I didn’t even know Sandra bullock had a sister but the book does sound intriguing enough to give it a try! Thanks for stopping by, Simone! Hope you enjoy the book if you read it. I completely agree with your mom. Yes, Sandra Bullock is her sister and telling us about working for her production company and choosing to leave it would have been enough. I wanted to read more about baking. However, I did enjoy the anecdotes about her customers. She did just come out with a new cookbook, Sugar Baby, which has good reviews so far on Amazon. I did enjoy her stories, and her voice comes through clearly. I got Sugar Baby as a birthday gift, and it seems like a great cookbook. I haven’t made anything from it yet, but I’m excited to! I’m so glad you posted that video! I love the snark. That’s exactly how I heard her voice as I was reading the book. She looks and sounds so much like her sister, no wonder the “Sandra Bullock’s sister” part of her identity is inescapable. Do you think you’ll try any of the recipes? I really think that watching the video made me appreciate her writing more. Since I follow her on Twitter, I think it’s fun to see how proud she is of her sister (when she won her Oscar, for example), but I can’t imagine how rewarding it must be to really have her own identity after moving away from Hollywood. it humanizes celebrities, right? they are normal people with little sisters who cheer them on while simultaneously being jealous of their success and beauty. I don’t know if that’s true, though. She seems legitimately happy for her sister, and she wanted to leave Hollywood. I’m glad she has found her own success, even if her sister’s shout out in a magazine interview didn’t hurt. She still had to have a quality product to back it up. True. What I meant by that is that she didn’t seem to truly happy until she found success away from her sister. She was successful by societal standards (good money, steady job) in Hollywood, but she resented that lifestyle – which was directly related to her sister’s career. Make sense? Previous post: vegetarian kimchi recipe: too much of a good thing? Next post: weekend in brief and the cookbook winner!